It is not just the PP’s Mariano Rajoy who has dismissed as naked opportunism Rubalcaba’s attempt to reinstate the old Wealth Tax. 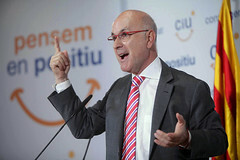 Josep Antoni Duran Lleida, the spokesman of Convergència i Unió in the Congress has criticised the Socialists and their candidate Rubalcaba for being populists. Duran admitted this morning that the fiscal system does need reform, but urged that this should be done “without penalising savings” and in a way which does not hurt the middle classes. “Simply bringing back the Wealth Tax is madness,” he said.